Today’s Train Track Tuesday needed to be photographed from standing on top of Norton’s bed. It was the only way to get it all in one frame. 🙂 This track lasted a few days. On more than one occasion, Norton stayed up past his bedtime and played trains quietly in his room. Since adding to our train track collection, building Norton’s wooden railway layout has become much more time consuming. Now it’s officially a once (or twice) a week activity. Since we don’t actually really watch any of the train shows, Norton doesn’t require that we have any brand loyalty. That means that we have a variety of Chuggington and Thomas stuff. 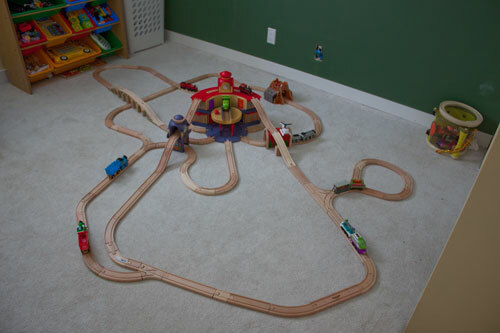 This layout features the Chuggington Deluxe Roundhouse, the Chuggington Clock Tower playset, the Thomas and Friends Wooden Railway Echo Tunnel, a no name tunnel, and a no name viaduct bridge.